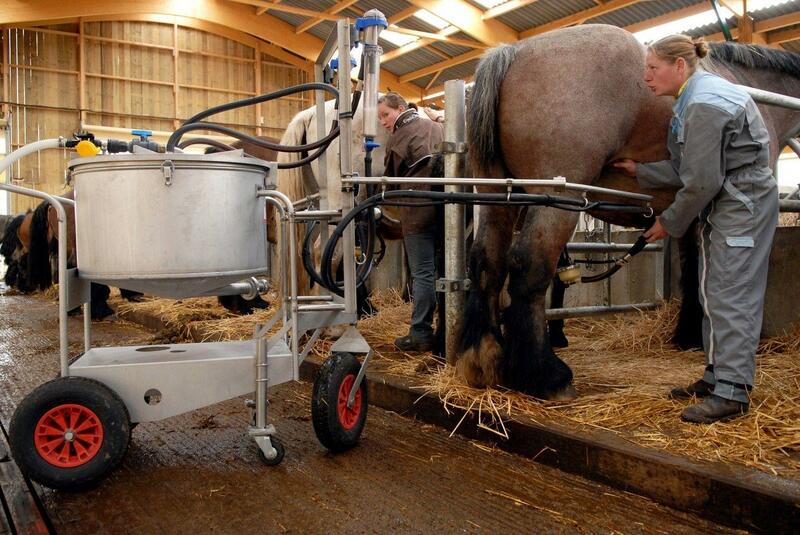 Mare’s milk is the milk produced by mares to feed foals during the first six months following their birth. Jenny’s milk is the milk produced by jennies (female donkeys) to feed their young during the first six months following their birth. Mare’s milk and jenny’s milk have been used for millennia, both for their nutritional benefits ad their cosmetic qualities. Throughout history, a number of famous people have sung the praises of this type of milk. Cleopatra, among others, bathed in this precious milk. Aristotle, Hippocrates and other dieticians and physicians of antiquity recommended it to treat poisoning and war wounds…. The long life expectancy and vigour of the Mongols who consume large quantities of mare’s milk have led representatives of Russian medicine to use it for therapeutic ends. During the 19th century, mare’s milk was used as a substitute for mother’s milk. Very easy to digest, it also helped those who suffered from cirrhosis, stomach ulcers, gastric and chronic intestinal pain, constipation, and various problems tied to the gallbladder ad pancreas. As an extension of these practices, mare’s and jenny’s milk were given to new-borns at the Saint-Vincent-de-Paul hospital in Paris, and at its maternity wards (Libourne, Le Mans, etc.) until the mid-1950s. It is also during this period that German and Finish doctors showed the similarity between mare’s milk and maternal milk, thus justifying its use as a maternal milk substitute since it guaranteed a better absorption than other types of milk. The composition of mare’s milk is similar to maternal milk. Both mares and women have single stomachs, with a digestive system that is much less developed than that of ruminants (cattle, goats, sheep etc.) which have a two-stomach system that leads to the oxidation of polyunsaturated fatty acids and Vitamin D. In the mare, the digestive process returns the unsaturated fatty acids and vitamins that are richly present in the fodder. Mare’s milk is a natural source of calcium. Its calcium levels are 2-3 times higher than maternal milk. It is astonishing how closely the composition of mare’s milk resembles that of maternal milk. It is rich in essential vitamins (A, D, E, C, K, B6, B12, B1-2-35), Oligo Elements (iron, zinc, copper, manganese) and minerals (calcium, phosphorus, sodium, magnesium). Its fat content is lower than either cow’s milk or maternal milk. In addition, the fact that it is low in casein (a protein) makes it very well tolerated by people who are allergic to the proteins in cow’s milk. Mare’s milk is naturally very rich in anti-oxidant vitamin C. Vitamin C helps the workings of the immune system and plays a role in the absorption of iron. It also contains lysozyme, an enzyme that has an anti-microbial property. Mare’s milk can play an important part in the immune system due to some of its principal ingredients. Mare’s milk owes its properties for preventing anaemia to its high levels of iron which are associated with the presence of the protein lactoferrin (LF), also known as lactotransferrin (TLF), which has the property of fixing this Oligo Element and carrying it through the bloodstream (Franco-Rodriguez et al, 2008). In the absence of clinical studies on the qualities of mare’s milk, these still needing to be put in place, numerous observations indicate that it can be significantly helpful in aiding recovery after chemotherapy treatments for which it appears to reduce side-effects. For digestive ailments, mare’s milk can help to improve certain problems by acting as a probiotic. In addition, it would seem that the anti-inflammatory properties of mare’s milk can reduce the intestinal inflammation caused by Crohn’s Disease. Due to its high proportion of vitamins, minerals, fatty acids (Omega 3 and Omega 6) and amino-acids, mare’s milk has been shown to help people suffering from depression as well as problems such as stress and anxiety (Csapó et al. 1995, Malacarne et al. 2002, Haddad et al. 2011). 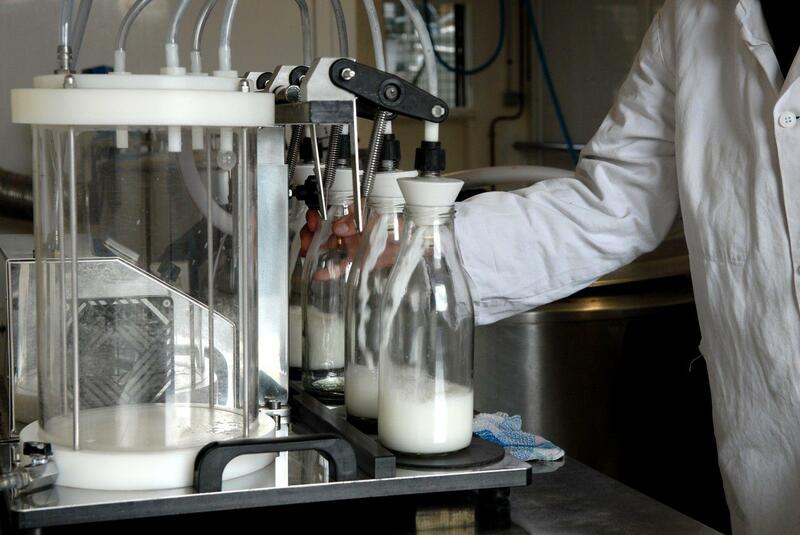 Mare’s milk plays a major role in facilitating the absorption of certain components needed by the organism, such as calcium which is better assimilated as it is provided jointly with vitamin D, lactose and oestrogens. Consequently, for a diet that meets the needs of the body in calcium, among other nutrients, mare’s milk can play a part in preventing conditions such as hypertension. (Hernandez et al. 1999). The presence of lactoferrin (LF) would appear to give mare’s milk moisturising properties, as well as regenerating properties, thus helping to slow down the aging of the skin. Due to its anti-bacterial make-up, mare’s milk would also be beneficial for skins liable to acne; it also help in treating more significant skin complaints such as eczema and psoriasis, due to its healing properties. Jenny’s milk was used in the 19th century an through the early years of the 20th century as a substitute for maternal milk. Jenny’s milk is still regularly recommended as a substitute for cow’s milk for children who show an allergy to the proteins in cow’s milk. In ancient times, Hippocrates used to prescribe jenny’s milk for a variety of medicinal uses. Just like mare’s milk, jenny’s milk is very close to maternal milk in that it is highly digestible as it has no clotting casein and a low fat content. Asses milk brings vitamins (A, B1, B2, B6, D. C, E) and minerals and Oligo Elements (calcium, magnesium, phosphorus, sodium, iron, zinc…), bio-stimulants (immunoglobulins), and alkylglycerols which are active in the immune response. It is suitable for babies who are severely allergic to the protein in cow’s milk, as well as babies who suffer from digestive problems. It strengthens natural defences and helps fight stress. Its enzymes regenerate intestinal flora. It improves intestinal transit and favours the detoxification of the liver. Lysozyme-rich asses’ milk has been tested on mice where it shows anti-inflammatory properties by compensating for the endogenic deficiency in antimicrobial peptides seen in ileitis, and by reducing dysfunctions in intestinal flora. This study makes it possible to put forward jenny’s milk as part of a back-up therapeutic strategy aimed at increasing the periods of remission in Crohn’s Disease (Yvon et al. 2014). Pliny the Elder recommended jenny’s milk in his Natural History for all kinds of ailment, most particularly to fortify those in convalescence, as well as for care of the skin, to fend off wrinkles, and for lightening the complexion. To this day, jenny’s milk is often used in cosmetics, most particularly due to its make-up of fatty acids and vitamins A, B1, B2, B6, D, C and E.
Rich in nutrients and natural assets, jenny’s mill is known for its skin moisturising, nutritive, calming, firming and regenerating properties. It is particularly recommended in treating eczema or psoriasis, as well as for dry, sensitive, reactive or older skin. 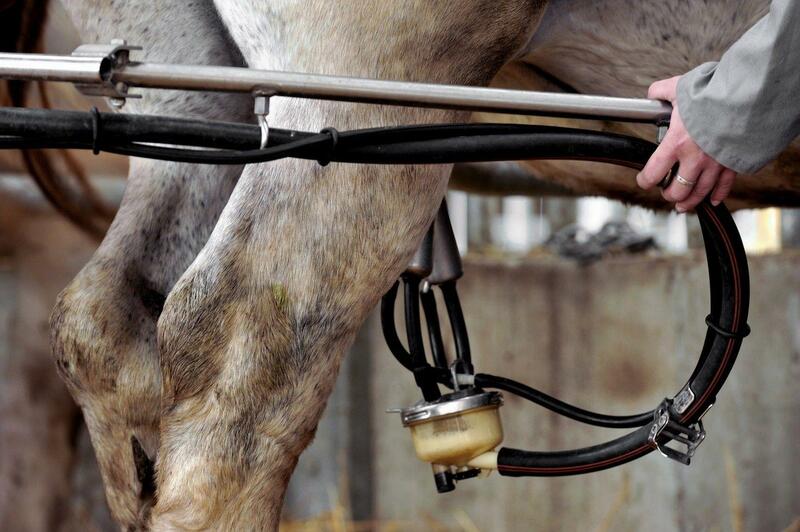 Mares produce between 10 and 20 litres of milk a day, depending on the breed. 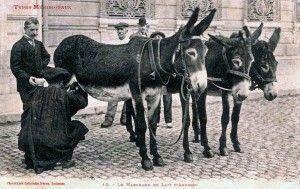 Equines have only two teats.